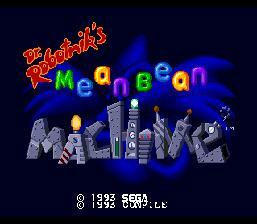 Play Dr. Robotnik's Mean Bean Machine Now! This game is kind of like a Tetris/Dr. Mario like game where you have to match a number of same colored beans in order to gain points. In Scenario Mode, you must stop Robotnik's plan for stealing the beans. You face a bunch of enemies throughout 13 stages! In 1P VS. 2P mode, you and another person go into an all-human Scenario Mode! You can change the skill level, too. In Exercise Mode, you freely practice your skills. Almost each game like this has one. Select "Continue" in Scenario mode and enter Purple Bean, Yellow Bean, Has Bean (the funny looking orange guy), and Clear Bean. Press A, B, and C on controller 1 to make "e", "a", and "n" in "Mean" jump. Pressing the buttons on Controller 2 makes the same letters in "Bean" jump.